Perhaps the clearest objective of the Teme Weirs Trust in repairing the three weirs was the reinstatement of a unique part of Ludlow’s architectural heritage. Less obvious perhaps is the care and attention to detail that was employed to restore the diverse aquatic habitats directly associated with the weirs, that had been lost on their collapse, as the river reverted to a continuous fast central stream. The combination of slow, deep leats and mill races, large calm areas above weirs, effervescent weir-pools, shallow fast riffles and shingle banks and islands have all returned. And together with them, the vast wealth and variety of native wildlife that had become scarce has reappeared. 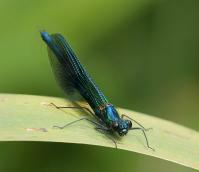 Insects now abound in the deep calm waters and the pool-tails, and their winged representatives – the Banded Demoiselle, Large Red Damselfly and Mayfly, to name just three – have been particularly abundant in 2007. The insects in turn support healthy bird and fish populations, and these in turn attract larger birds and mammals. The principal resident songbirds – Dipper, Grey Wagtail and Kingfisher are all breeding successfully following the restoration; indeed the first two species have special masonry cavities and nest-boxes installed in sluice-gates for nest-sites, all of which have been taken up within the first year. 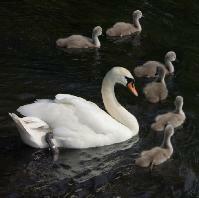 Fledging of all species has been successful, despite the floods at a critical time. 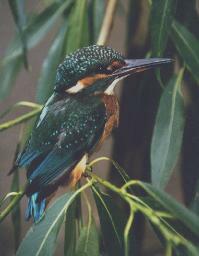 Kingfishers abound and continued their nesting close to the building works throughout. The abundance of this species is thanks in part to a series of mild winters, and partly to the burgeoning shoals of minnows and sticklebacks which may be seen in the shallow pools close to the weirs. The success of the resident duck population is owed largely to support from local Townsfolk who regularly feed them, and they flourish in spite of the serious depredation of their young by the Herons in their own breeding season, apparently easier prey than fish! The Herons instantly recognised the significance of the fish-passes and are to be spotted regularly at both stations, waiting with infinite patience for the smaller Brown Trout that run the passes with the Salmon. Salmon now have an easy run up-river using the passes, though it’s still possible to see them leap at Mill Street and at Casemill, away from the passes. Trout also, are, it seems infected by the leaping frenzy, and will jump the weir too, though they have not the same need as Salmon to travel far upstream to spawn. Autumn and Spring gives a chance to glimpse another bird on the gravelly river islands – the Common Sandpiper, an African migrant who has chosen the Teme’s banks as its breeding grounds. You will be lucky to spot this attractive wader as it bobs along the pebbles, although its shrill piping call often betrays its presence. The expanding population of Otters is also testament to the rich stocking level of many fish species which tend to accumulate around a weir, particularly in the pools. Near to the weir edge you may well discover a spraint, or a fish-head and spine, with scales as evidence of a successful catch and a meal. You’ll be less likely to be lucky in catching sight of this elusive, charismatic but generally crepuscular native mammal. However, one was filmed recently in broad daylight, wrestling and devouring a large eel on the Casemill island. Sadly, Mink are still prevalent, but not on the increase, and this year (2007), a family of Swans escaped their predation by nesting on the ‘inhabited’ bank of the river. This slow section, between the weirs, is now attractive to these birds, whereas previously it was too fast and shallow. After a near initial disaster with a flooded nest, 8 eggs hatched, only to have two cygnets taken by crows on the first day as they were swept away by the flood. Since then – up to 30th Sept – the six surviving cygnets have remained healthy and developed into adult-sized birds, with flight feathers, though still patchily grey and flightless as yet. 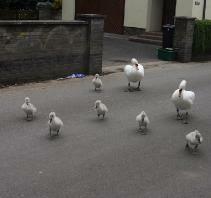 One of the main problems in this summer was protecting them as they took to the very busy Temeside road to escape the exceptional floods that we experienced. Traffic control was a headache! 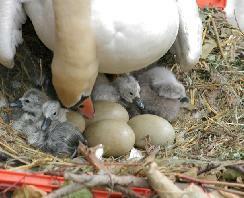 We do hope that this exceptional occurrence will not deter them from returning to this site next year to breed again. Another mammal which has been sighted, but not yet verified as a resident is the Water Vole. The population of this charming vegetarian rodent is seriously threatened nationally. We hope that with the restoration and reconstruction of the river-banks, this welcome creature will at last be counted as a true resident in the near future. This account is a brief resume of some of the more conspicuous wildlife species that have benefited from the weirs’ restoration; they represent but a small fraction of the overall spectrum of multifarious inhabitants, both fauna and flora, that now enjoy the diverse suite of habitats recreated by that radical yet sensitive operation, which happily is now complete. All photography �Gareth Thomas FRPS.